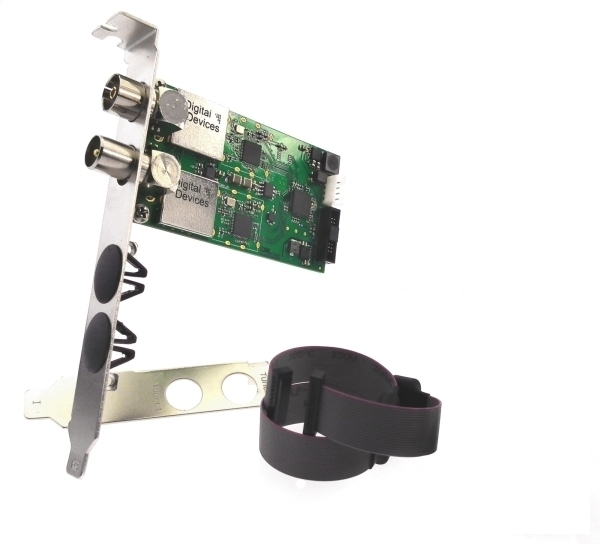 Product information "DD Cine C2T2I V7 & DuoFlex C2T2I V3 (SET) - 4 Tuner DVB-C/C2/T/T2/ISDB-T for PCIe"
Full profile bracket K is included. 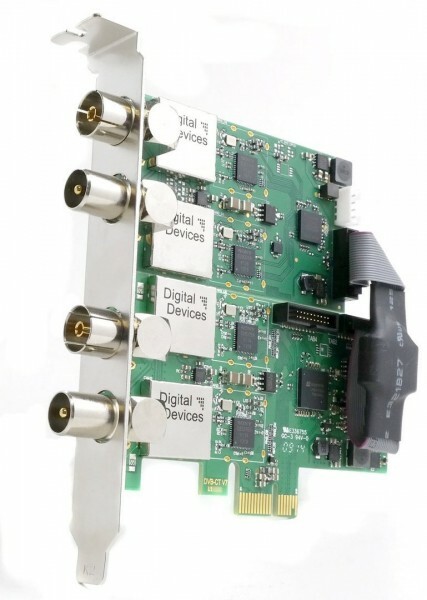 Related links to "DD Cine C2T2I V7 & DuoFlex C2T2I V3 (SET) - 4 Tuner DVB-C/C2/T/T2/ISDB-T for PCIe"
HD Twin Tuner TV Card - also DVB-T2 SimpliTV Austria ORF Transmitter - TV Card (PC) DVB-C, DVB-C2, DVB-T, DVB-T2, ISDB-T and digital radio via cable or terrestrial for the PCI Express Slot. The Ultra-Low Profile PCI Express card expand a compact PC system into a Media Center PC for your living room with TV enjoyment, thanks to the dual-use 2 TV tuner (twin tuner) you can wath and record simultaneously. With the Digital Devices Cine C2T2I (Rev. V7) you are ready to receive your favorite shows . 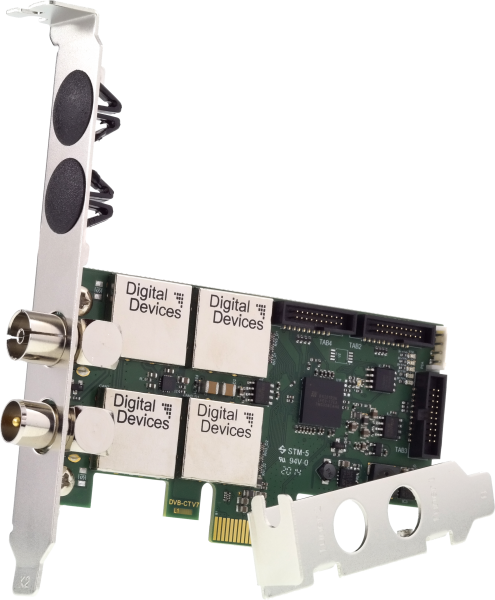 Receive digital cable radio and cable television (DVB-C and DVB-C2) as well as digital terrestrial television / radio over antenna (DVB-T and DVB-T2). 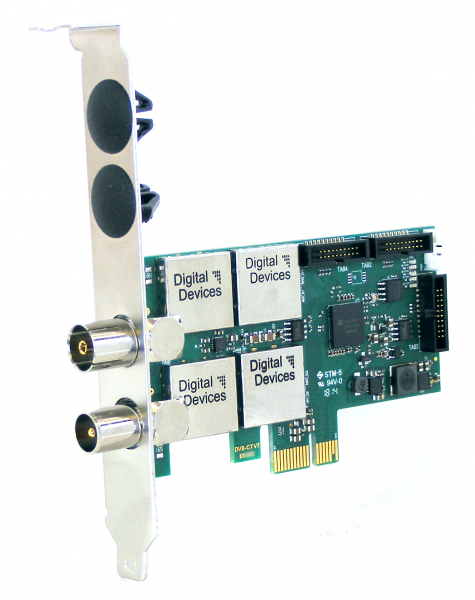 Digital Devices Cine C2T2I comes with DD-TV software. Experience the features, like: HD quality television, time-shifted TV, Digital Video Recorder, Electronic Program Guide (EPG), Teletext reception. The Digital Devices Cine C2T2I (Rev. V7) is modularly expandable thanks to its three expansion ports. So you can expand your system up to 8 TV tuners using only one (!) PCI Express slot. Any combination with additional TV tuners (twin tuners) and CI interface extensions are possible. A cross-reception combination of satellite TV, cable TV and digital terrestrial TV is also possible at any time. Discover the numerous expansion possibilities. In Germany, you can usually receive the public TV programs (ARD, ZDF, third programs and additionally many radio stations) in HD quality without SmartCard with a TV cable connection. For some customers with cable connection (for example cable Germany, cable BW and Unitymedia) also numerous private TV programs in the cable are digitally free receivable. Optional: For the complete reception of all programs (scope depending on their concluded contract with the content provider) use our CI-Interface extension. This can be connected directly to your Digital Devices card. Where is the difference between the Cine CT2, C2T2 and the Cine C2T2I? The Cine C2T2 also supports the future reception mode DVB-C2 compared to the Cine CT2. The advantages of DVB-C2 are improved video compression, better signal to noise ratio, higher channel efficiency and 8 MHz flexible frequency bands. The reception mode DVB-C2 will be introduced in Germany in the year 2017/18 according to current planning. With the Cine C2T2I, now also th reception type ISDB-T is supported. The card comes with signed drivers for Windows® XP with Service Pack 2, Windows® Vista, Windows® 7/8/8.1/10 for 32-bit and 64-bit as well as driver support for Linux. The BDA driver technology enables the problem-free immediate use of the product in numerous software products. Examples are: DVB Viewer Pro, MediaPortal, XBMC / Kodi, VDR, TV headend and many other products. The Simpli TV module requires a CI extension module. The SimpliTV module was tested with the ORF (Austrian Broadcasting) stations via 2 tuners simultaneously (MTD).